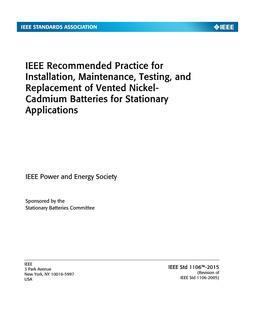 This guide discusses operational parameters that may be observed by battery monitoring equipment used in stationary applications, and the relative value of such observations. Although this guide does not give a listing of commercially available systems, it does provide a means for establishing specifications for the desired parameters to be monitored. Today's critical backup power environments have created a need for reliable monitoring of stationary batteries to determine the current state of health (SOH) of these systems. This guide will define various parameters for battery monitoring that will provide useful information to aid in the ongoing maintenance and potential replacement of these batteries. 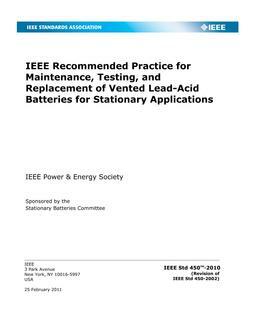 In addition, other areas affecting battery monitoring, including intermittent charging, communication interface, security, and operating environments, are also addressed in this guide. Revision Standard - Active. Operational parameters that may be observed by battery monitoring equipment used in stationary applications and the relative value of such observations are discussed in this guide. Although a list of commercially available systems is not given, a means for establishing specifications for the desired parameters to be monitored is provided.